Two lovers are caught up in the events of the Armenian genocide. In a poorly conceived speech at this year's Golden Globes ceremony, Meryl Streep painted a false portrait of Hollywood as a diverse utopia, citing the presence of Ruth Negga, Dev Patel (both of whose backgrounds she incorrectly cited) and Viola Davis at the prestigious event. "America may be a mess, but Hollywood's doing fine," was the general message. The statistics tell us this is far from the truth of course. Negga, Patel and Davis have yet to be offered a leading role in a Hollywood production as meaty as the dozens Streep has taken advantage of throughout her career. Davis is currently 51. By the same age, Streep had starred in Kramer Vs Kramer, Sophie's Choice, Silkwood, A Cry in the Dark, Postcards from the Edge and Out of Africa, to name just a handful of her more acclaimed performances. Despite box-office returns consistently telling us otherwise, Hollywood still believes a movie star is required to sell a movie. This excuse is trotted out every time whitewashing occurs in its many cinematic forms. "We don't have an Asian star big enough to headline a movie," was the reasoning behind the casting of Scarlett Johansson in a Japan-set anime. That might be a fair argument if Hollywood didn't keep affording huge opportunities to unknown white actors. The biggest movie of all time was headlined by an Australian nobody outside of that country had ever heard of. That movie was Avatar; of course, if you take inflation into account the biggest movie of all time is still Gone with the Wind, which is kind of apt in this particular discussion. 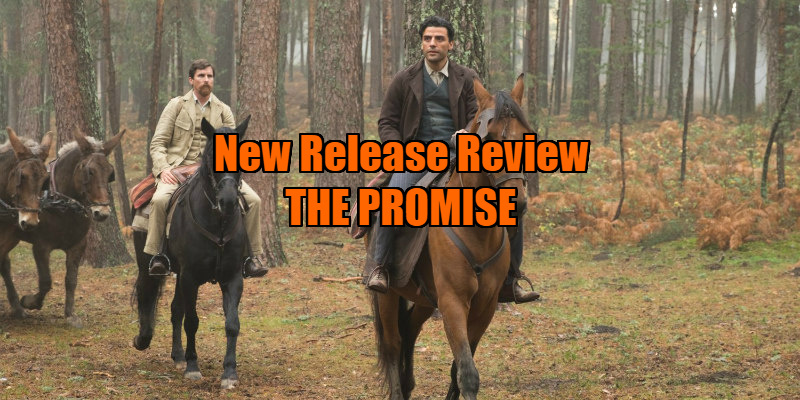 The producers of The Promise, a lunk-headed romance set against the backdrop of the mass slaughter of ethnic Armenians by the Turkish army at the outset of WWI, will no doubt tell you they required stars to sell this story to the public. In fairness, in this case they might be right. Genocide isn't exactly an easy sell, and the biggest name in the Armenian acting diaspora I can muster is Eric Bogosian. Some of the film's producers are members of the Armenian General Benevolent Union, a group dedicated to the preservation of Armenian culture. They clearly believe this is a story worth telling. It is, but not as portrayed here, like a nightmarish mash-up of Schindler's List and Fiddler on the Roof. Oscar Isaac is Mikael, a young Armenian who takes up a place at a college in Constantinople after promising his hand in marriage to a local woman (Angela Sarafyan). He finds himself distracted from his studies by the arrival of Ana (Charlotte Le Bon), a young Armenian raised and educated in Paris. The two fall for each other, but there are two obstacles in their way. One is Ana's lover, American journalist Chris Myers (Christian Bale). The other is the genocide of Armenians being undertaken by the Turkish authorities. How inconvenient. Even if the leads were played by native Armenians, this premise and the film's ignorant handling of it would be outrageously misjudged, but having western stars portray the central couple just underlines how problematic this film is. There's a disconnect between the very western Mikael and Ana and the events surrounding them. The genocide occurs in the background, and even when our two lovers find themselves caught up in its violence, it's as though it's playing out on a greenscreen behind them. At one point they escape being rounded up and hide out in the home of a sympathetic Turk, where they immediately begin to enthusiastically make love - even a pornstar with a jar of viagra in his system would struggle to perform under such conditions. Later, the film reaches its offensive apogee when the death of one of the few characters played by an Armenian born performer serves as a convenient plot point that allows Mikael to get jiggy with Ana guilt free. As played by the American Isaac and Canadian Le Bon, it's impossible to think of Mikael and Ana as anything other than tourists in this tragedy. In its climax, The Promise pays homage to that other great romance amid tragedy epic, James Cameron's Titanic, as a character sinks into the depths of the sea, before a pop song plays over the end credits OF A MOVIE ABOUT THE ARMENIAN GENOCIDE!!! The Promise ends with a quote boasting how as long as there are two Armenians alive in the world, Armenia itself will survive. What a shame they couldn't find two Armenians to star in this movie. 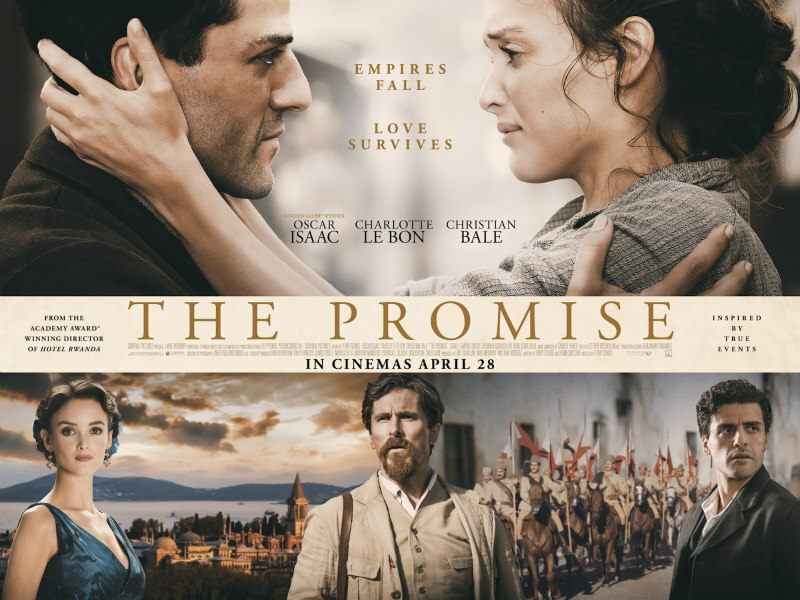 The Promise is in UK/ROI cinemas April 28th.